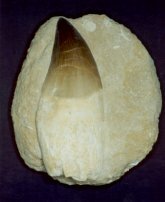 Size: Tooth with root is 4.3 inches long. This is a huge specimen of Mosasaurus anceps from the Cretaceous of Morocco. The tooth retains a large portion of the natural root. This tooth exhibits excellent detail. Very fine serrations are displayed along the cutting edge of the tooth. The enamel of the tooth is wonderful. The tip of the tooth is near perfect. The fossil has wonderful color and contrast. It is well centered on the rounded block of matrix. This is a very displayable mosasaur tooth from Morocco.